Stiffness is one of the primary reasons for patient dissatisfaction with their total knee arthroplasty (TKA). Because stiffness is a challenge to manage, the best treatment option is to prevent it from occurring in the first place, says Raj K. Sinha, MD, PhD, from STAR Orthopaedics in Rancho Mirage, California. Speaking at ICJR’s annual Winter Hip & Knee Course, Dr. Sinha said the problem is that all patients are potentially at risk, and it is difficult to predict which ones will develop stiffness and which ones won’t. 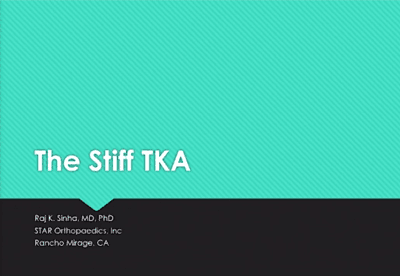 He said that all patients have some modifiable and/or non-modifiable risk factors for stiffness after TKA, such as age, smoking, and prior surgeries. They’re further at risk just from the surgery itself, as errors in the surgical technique – including malpositioning the implant, overstuffing the anterior compartment, and an implant that’s the wrong size (too big or too small) – can lead to stiffness. Dr. Sinha considers 10 of flexion contracture to indicate stiffness. Patients who struggle to get to 90 of flexion typically have functional limitations that require intervention, he said. One piece of advice he has for preventing stiffness is to check that the patient has full extension of the knee during the procedure. His circulating nurse, standing 10 feet away from the table, determines if the knee is in full extension; those who are right at the operating table may get a distorted view of extension. To learn more about these options, click the image above and watch Dr. Sinha’s presentation. Dr. Sinha has no disclosures relevant to this presentation. Scranton PE Jr. Management of knee pain and stiffness after total knee arthroplasty. J Arthroplasty. 2001 Jun;16(4):428-35. Nicholls DW, Dorr LD. Revision surgery for stiff total knee arthroplasty. J Arthroplasty. 1990;5 Suppl:S73-7. Kim J, Nelson CL, Lotke PA. Stiffness after total knee arthroplasty. Prevalence of the complication and outcomes of revision. J Bone Joint Surg Am. 2004 Jul;86-A(7):1479-84. Yercan HS, Sugun TS, Bussiere C, Ait Si Selmi T, Davies A. Neyret P. Stiffness after total knee arthroplasty: prevalence, management and outcomes. Knee. 2006 Mar;13(2):111-7. Epub 2006 Feb 20. Gandhi R, de Beer J, Leone J, Petruccelli D, Winemaker M, Adili A. Predictive risk factors for stiff knees in total knee arthroplasty. J Arthroplasty. 2006 Jan;21(1):46-52. Previous articleCan CAS Improve Outcomes in Knee Replacement?